Home » Fashion Nostalgie by Mag-Helly. 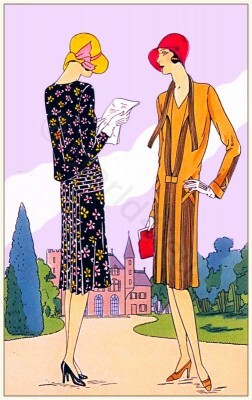 Left: Model of Nostalgie by couturier Mag-Helly. Right: Model of Mascotte by couturier J. Magnin. Source: Les créations parisiennes. La mode est un art. Editors: Maggy Rouff and Germaine Lecomte. Published: Paris 1929.